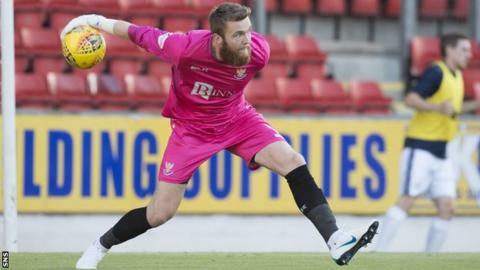 St Johnstone goalkeeper Zander Clark will be back "in a matter of weeks rather than months" after injuring a hamstring, says manager Tommy Wright. Clark, 26, was absent for Saturday's 0-0 Scottish Premiership draw with Rangers - the first time the goalkeeper had missed a game this season. But a scan on his hamstring has revealed less damage than first feared. "Importantly there is no tear to Zander's tendon," Wright told St Johnstone's website. "The hamstring and tendon are stretched but the fact that there is no tear there means we can hopefully have Zander back to full fitness in a matter of weeks rather than months." No goalkeeper has kept more Premiership clean sheets than Clark this term, with the custodian recording 11 in 25 appearances. He was overlooked by Scotland for the Nations League matches with Albania and Israel in November, but national assistant coach James McFadden said he was under consideration for next month's European Championship qualifiers in Kazakhstan and San Marino.